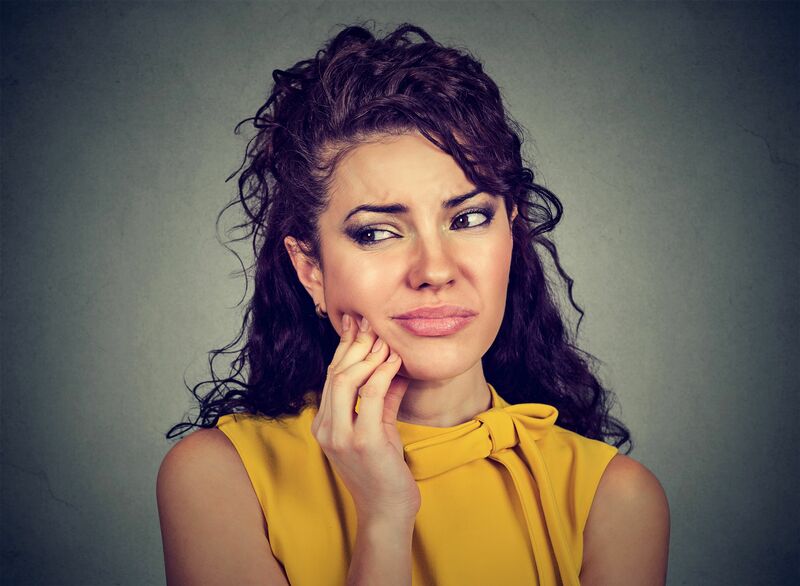 If you have tooth decay or gum disease that is left untreated, or if you have an injury or trauma to your teeth or gums, then you may develop a dental abscess. A dental abscess is a buildup of pus that is caused by a bacterial infection. They have different names depending on their location. A periodontal abscess – an abscess that forms in the gum. A periapical abscess – an abscess that forms at the end of a tooth. If you develop a tooth or gum abscess, it is important to get it checked out by your dentist as soon as possible. This is because if they are not treated, they can spread to other parts of the body and cause further complications and even serious illness. Pain. Abscesses usually cause some degree of pain, from very mild throbbing to acute and intense discomfort. The pain may be localized in your affected tooth or gum, or may spread to the ear, jaw and neck on the affected side. The pain may worsen when you are laying down, and stop you from sleeping well. Sensitivity. Patients with a tooth or gum abscess may experience sensitivity to particularly hot or cold food/drink. Redness and swelling. Your face and/or gums may look red and be swollen. Affected tooth. You may find that you have a tooth that is particularly tender, or is discolored and loose. Bad breath. Untreated dental abscesses often lead to the development of fistulas which leak infected fluid into your mouth. This can cause bad breath and a nasty taste in your mouth. Abscesses are caused by underlying infections. If the infection isn’t treated, it won’t go away by itself. Instead, it could last for months or even years and cause a plethora of associated health problems. A common complication from failure to treat an abscess is the development of a fistula. Fistulas, sometimes called sinus tracts, are hollow tunnels that develop through the tissues and bone in order for the pus from the abscess to drain away. Fistulas are small and often appear as a pimple inside your mouth. You might also notice a strange or foul taste in your mouth. Another issue with untreated abscesses is that they develop to form cysts in the jaw bone. These fluid-filled bubbles may come out if the affected tooth is extracted, otherwise root canal will be necessary to remove the infected nerve. If root canal is unsuccessful, surgical intervention may be the only way to remove the cyst. If you believe that there is a chance that you have a tooth or gum abscess, you should make an appointment with your dentist as soon as possible. Your dentist will be able to perform an oral examination to determine if you have an abscess, and if so, what the best course of treatment is. If the infection began inside a tooth. Your dentist will drill a small hole in the tooth to allow the abscess to drain. Root canal and a cavity filling or crown will be necessary, and these may be done at the same appointment, or scheduled for a few days later. If you have developed a fistula. It will be necessary for your dentist to identify the source of the infection. This will be done using a thin, flexible tool that is inserted into the fistula and tracked via x-ray imaging, so your dentist can see where it leads. The infection can then be cleared and cleaned, and the fistula should heal by itself. If extraction is necessary. In some cases, where a tooth is badly damaged or the abscess is particularly large, your dentist may recommend extraction. The abscess will also be drained, which will be done through a hole created in the gum through the jawbone in order to reduce the likelihood of the infection spreading. Abscess treatment is usually accompanied by a course of oral antibiotics, to help deal with the infection and prevent it from causing further problems. If you are concerned that you might have a tooth or gum abscess, make an appointment with your dentist or periodontist as soon as possible for an examination. Prompt treatment can prevent further pain and problems, and help you to maintain excellent oral health.